Now in its 63rd year, the UEFA Champions League has seen many of the greatest footballing moments of all time, from Vladmir Jugović’s penalty which gave Juventus bragging rights in 1996 and Liverpool’s Istanbul ‘miracle’ in 2005 to Ronaldo’s winning penalty in 2016. With the much-anticipated quarter-finals of the 2017 / 18 tournament kicking off today, the UK’s biggest-selling manufacturer of football goals, FORZA by Net World Sports, has analysed and ranked the debut ages of this season’s players who keep finding the back of the net. Top goal scorer, Cristiano Ronaldo made his professional debut at the age of 17? Two years later than Sergio Agüero who made his debut at 15. Wissam Ben Yedder was the oldest out of all the top goal scorers to make his professional debut. Liverpool has the most goal scorers in the top 12, who combined have scored 24 out of the club’s 28 goals in the tournament so far and have an average professional debut age of 17 years and nine months. As aspiring young footballers sit down to watch their sporting idols compete in Europe’s premier club football tournament, they may be wondering if they’ll ever make it pro as times goes on, but all is not lost. With the second top goal scorer of the Champions League so far making their professional debut in their 20s, there is still time to brush up on those skills and learn how to bend it like Beckham. It will come as no surprise that Cristiano Ronaldo comes out on top as the player to have scored the most goals in the tournament so far, but when it comes to making his debut he’s very much on par with the rest of the contenders, making his first professional appearance with Sporting CP at the age of 17. Second in the top goal scoring league, despite having played 214 minutes less than the Ballon d’Or winner Ronaldo, is Sevilla’s, Wissam Ben Yedder. With eight goals under his belt during the seven games he’s played this tournament so far, the forward made his professional debut in October 2010 at the ‘grand old age’ of 20 for Toulouse FC, showing you’re never too old to give it ‘and’ go. The top goal scorer who made the youngest professional debut was none other than Sergio Agüero. The Manchester City forward began playing for Argentinean team, Club Atlético Independiente in July 2003 at the young school age of 15. Whilst he still comes out on top as Manchester City’s best goal scorer in the tournament, he’s a long way off the over top spot despite getting a two-year head start on the leaders’ debut age. With Juventus and Real Madrid going head to head first on Tuesday 3rd April at the Italian club’s stadium in Turin, the top goal scorers for both clubs, Higuaín and Ronaldo, will be wanting to make long lasting impressions before the second-leg kicks off just eight days later in Spain. With both forwards making their debuts at the age of 17, there is all to play for in this match and whilst there is a seven goal difference between them going into the quarter-finals, Ronaldo has played the full 90 minutes for every game whereas Higuaín has played on average 81.25 minutes. Sevilla and Bayern are also playing their first leg of the quarter-finals on Tuesday 3rd April which will see the Spanish side play at home. Whilst both have had three wins throughout the tournament Sevilla are lagging behind with two losses to Bayern’s one loss and a draw. Bayern’s top goal scorer, Robert Lewandowski made his debut at 18 years of age for Polish club Znicz Pruszków, however with five goals scored in the tournament over 608 minutes played he’s far off Ben Yedder’s eight goals scored over 506 minutes, despite only making his debut at the age of 20. It’s the clash of the English teams on Wednesday 4th April, as northern rivals Liverpool and Manchester City go up against each other. With Manchester City leading by 18 points in the Premier League, winning 26 of the 30 games they’ve played this season so far, Liverpool will be wanting to prove a point as they head into this match and as far as the Champions League stats go, the odds are very much in their favour when it comes to the top goals scorers! With three of the top goals scorers in the tournament, not including Coutinho who left halfway through the season, Liverpool’s average debut age comes out at 18. Roberto Firmino is Liverpool’s top goal scorer in the tournament so far having reached the back of the net seven times in the eight games he’s played. The Brazilian made his debut in October 2009 for Figueirense FC at the age of 19, whereas Manchester City’s top goal scorer, Sergio Agüero has only scored four goals throughout the tournament even though he has been playing the glorious game six years longer. The last game of the first leg in the quarter-finals will take place at Camp Nou as Barcelona face Roma. It’s not the first time the clubs have met in the Champions League as Barcelona beat the Italian club 6-1 in the 2015 / 16 group stages of the tournament. 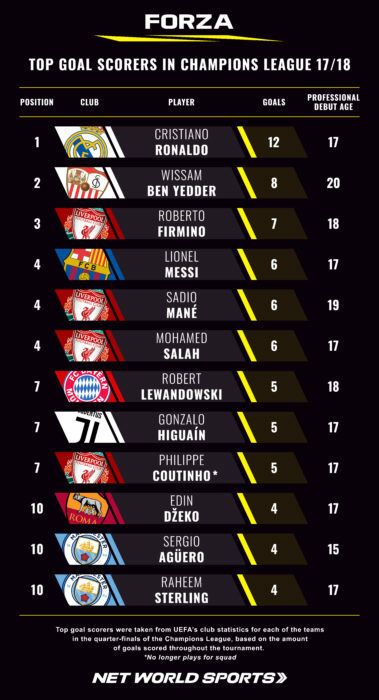 As it stands each team only has one player each in the top 12 goals scorers’ table, both making their debut at the age of 17… Barcelona’s Lionel Messi and Roma’s Edin Džeko. With both players now in their 30’s it is a pretty even playing ground when it comes to experience, but there is one huge difference and that comes in the form of two goals. Despite both forwards having played all eight games, with Edin Džeko playing over 100 minutes more than Messi, he has only scored four goals throughout the tournament compared to Messi’s six. All of this analysis proves, that it really doesn’t matter what age players make their debut, as long as they keep practising their skills. With FORZA goals made to see players through their entire footballing journey, they will be there for all moments, regardless of age and ability. 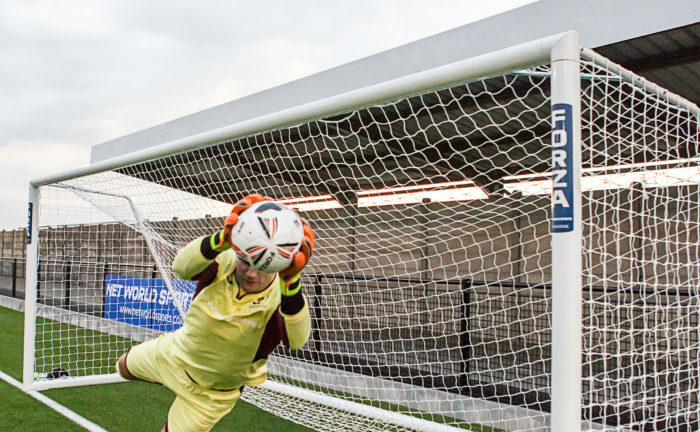 From PVC garden goals for children to hone their skills at home, through to premium aluminium match and practice goals in a range of sizes that can be used by football clubs, schools and sports facilities, FORZA has it all. 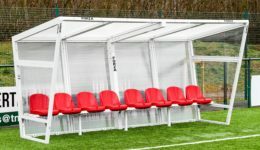 To discover more and #FindYourFORZA visit www.forzagoal.co.uk. – Top goal scorers were taken from UEFA’s club statistics for each of the teams in the quarter-finals of the Champions League. Those who had scored four goals or more were chosen. – Data was then collected from UEFA for each of the top goal scorers, including; current age, games played in the tournament so far as well as minutes. – The debut ages of each of the top goal scorers was found on https://www.transfermarkt.rs/.